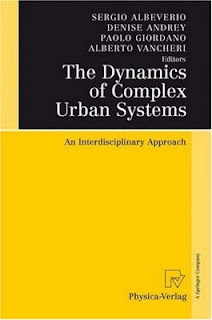 I just finished reading "The Dynamics of Complex Urban Systems: An Interdisciplinary Approach" edited by Albeverio, S., Andrey, D., Giordano, P. and Vancheri, A. and I thought I would share my thoughts about it. As we are all aware, cities play a crucial role in our lives, providing habitats for over half of the world?s population. However, understanding such systems is extremely complex as they are composed of many parts, with many dynamically changing parameters and large numbers of discrete actors interacting within space. The heterogeneous nature of cities makes it difficult to generalise localised problems from that of citywide problems. As Wilson (2000) writes, such understanding of cities represents "one of the major scientific challenges of our time". Such understanding how cities function is of crucial importance if we are attempting to tackle problems that such systems face (e.g. urban sprawl, congestion, segregation, etc.) or to make them more sustainable for future generations of inhabitants. One has to understand the complex interactions between urban systems in terms of internal factors (e.g. from the decisions of individuals such as deciding where to locate) to more external factors (such as international economics) along with social developments. Such underlying process can be slow or fast, acting locally or globally. Most urban theory until now has been based on the assumption of slowly varying spatial and social structures. However these notions are now being questioned giving rise to various types of models, such as those employing dissipative dynamics, stochastic cellular automata and agent-based models, fractal geometry, and evolutionary change models, and to further mathematically oriented approaches. In "The Dynamics of Complex Urban Systems", Albeverio et al. (2008) present a range of articles from leading scholars focusing on the above types of models and how approaches developed by different communities can be used to study urban systems and thus gain a greater understanding of how such systems operate. "The Dynamics of Complex Urban Systems" book is a result of an international workshop which had clear sessions ranging from general dynamical models (e.g. urban growth, pedestrian dynamics), models from economics and models for megacities (e.g. large-scale city formation, socio dynamics), models from information science and data management (e.g. data mining, GIS, data availability), related mathematical and physical theories and models (e.g. neural networks, power laws and phase transitions), models of calibration/validation and forecasts (e.g. comparison of empirical data and simulations), and dynamical models and case studies of real world systems. The chapters presented within this book are arranged alphabetically because the editors of the book believed that there was much overlap between the sessions and the subsequent papers. The only exception is that of the first chapter by Mike Batty entitled "Fifty Years of Urban Modelling: Macro-Statics to Micro-Dynamics" which provides an extensive, chronological and conceptual overview of urban modelling over the last fifty years in the context of current developments and which subsequent chapters explore in greater depth. From reading the edited book this is a well-made decision by the editors. 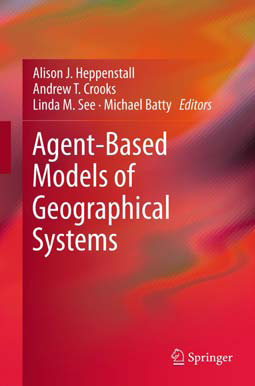 Many of the chapters cross many of the sessions and range from modelling individual movement such as pedestrian models through to traffic simulations and transport networks to the study of systems of cities and innovation processes along the way linking socio-economic and cultural factors (such as employment and housing) to various types of models. Overall the book is well written and makes a good source of reference of current research, specifically for those interested in studying urban systems using a variety of computational modelling approaches. Furthermore, the book highlights the need for cross-disciplinary research between the natural (e.g. physics, mathematics, computer science, biology, etc) and regional sciences (e.g. geography, economics, architecture, etc) with respect to improving our understanding of the complexities seen within urban systems and how such systems operate. Albeverio, S., Andrey, D., Giordano, P. and Vancheri, A. (Eds. )(2008), The Dynamics of Complex Urban Systems: An Interdisciplinary Approach, Physica-Verlag Heidelberg, NY. We just received a copy of Virtual Geographic Environments, the book has contributions by Jack Dangermond, Mike Goodchild, Mike Batty, Hui Lin and many others (including ourselves) and provides a unique guide to the current state of play in GIS and virtual environs. "Virtual geographic environments are essential to using GIS in design. For example, before a design for a city or landscape can be produced, an environment must be created through GIS. 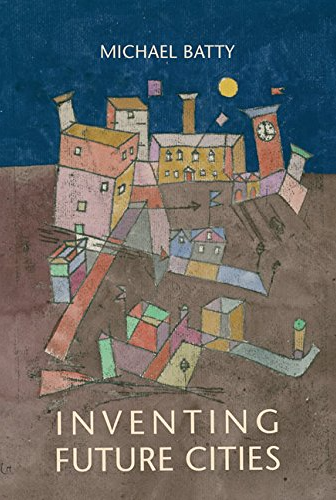 Thisbook cover is then fashioned into a form where users have access to it, first to enhance their understanding through exploration, and then to enable them to change various components in the effort to solve problems that can realize better designs. Only now, through the development of virtual city models and through new ways of enabling users to interact with geographic information using new screen technologies, is the point being approached where design is possible. 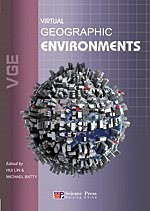 Virtual Geographic Environments, edited by Hui Lin and Michael Batty, collects key papers that define the current momentum in GIS and "virtual geographies." In some sense, such environments are the natural consequence of linking GIS to other technologies that deal with information, design, and service provision, and this will undoubtedly grow as it becomes ever easier to integrate diverse software and data across the Web. The idea that geographic information can be both collected and made available through Web-based services, using Web 2.0 technologies that network many millions of people together, has formed a major research thrust in software development over the last decade. The numerous contributions by leading members of the geospatial community to Virtual Geographic Environments illustrate the cutting edge of GIScience, as well as new applications of GIS with the processing and delivery of geographic information through the Web and handheld devices, forming two major directions to these developments. But the notion that these Web-based systems can be used to collect information of a voluntary kind through methods of crowd sourcing is also an exciting and widely unanticipated development that is driving the field. As these services gain ground, new business models are being invented that merge proprietary and nonproprietary systems and novel ways of integrating diverse software through many different processes of software development from map hacks to open system architectures. Virtual Geographic Environments is published by Science Press, China (www.sciencep.com), 350 pages, hardcover. For more information, contact the responsible editors Peng Shengchao and Guan Yan, Science Press (e-mail: guanyan@mail.sciencep.com)." Digital Urban has a competition to win a copy of the book, click here to read the question. A decision to move is never easy but I am about to leave CASA and start working in the Department of Computational Social Science at George Mason University in the USA. 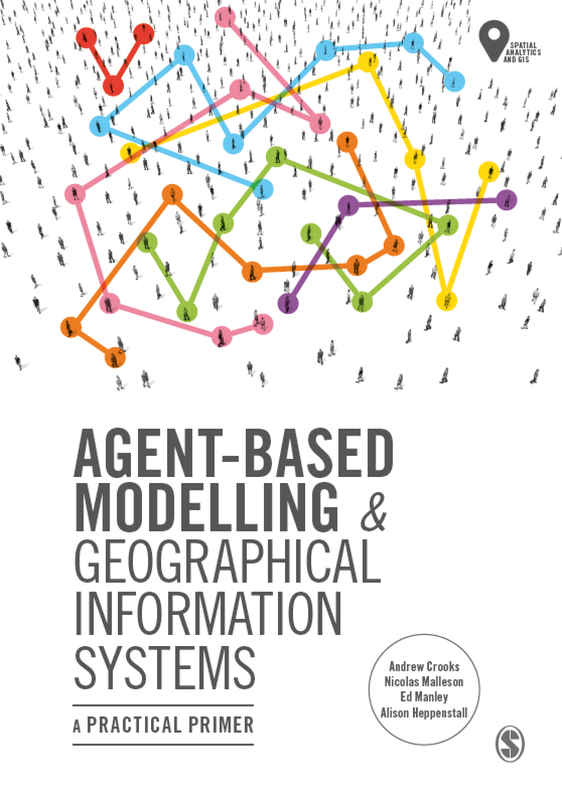 Over the last several years at CASA, not only have I learnt a lot and developed my skills in agent-based modelling and GIS, but also made some great friends. The CASA collective of Mike, Alan and Paul have given me much to think about, while the rest of the gang (both past and present, you know who you are!) has made my everyday life fun and challenging. I wonder how long did these fish last?